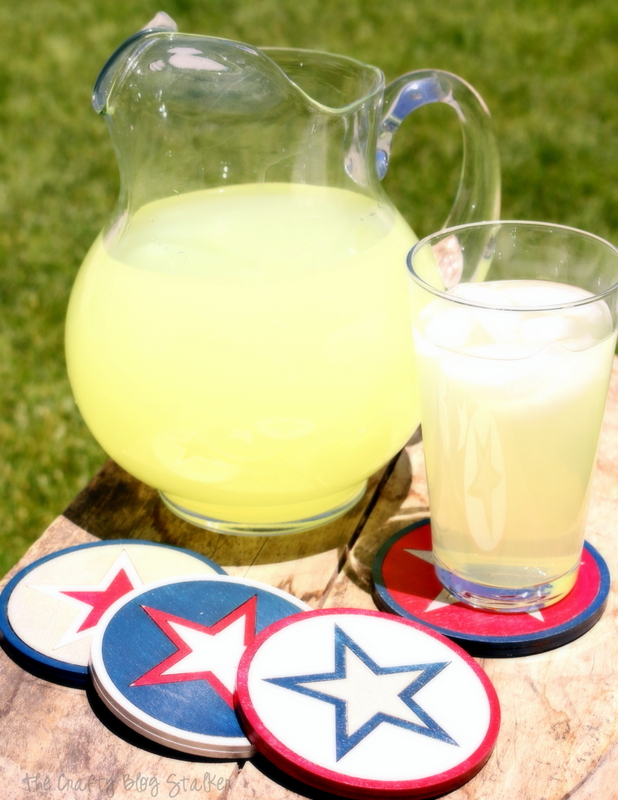 All-American Coasters are a perfect example of Americana. 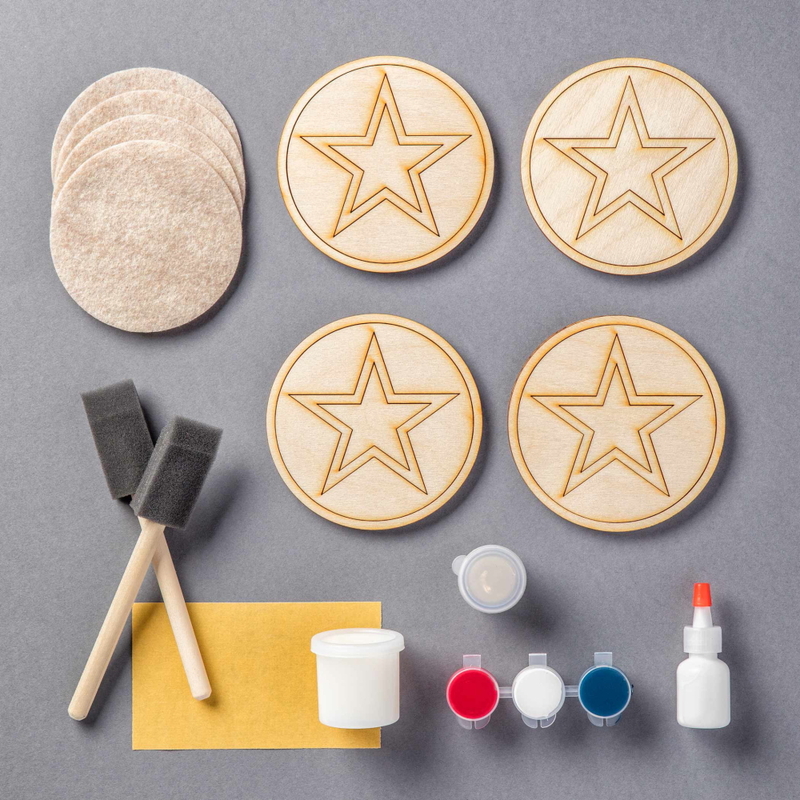 Show off your DIY patriotic side, or match your red, white, and blue home decor color scheme. If you live in the USA, I don’t have to tell you how patriotic the red, white and blue is. Throw in some stars and you’ve got an Americana home run! Throughout the summer you will see these iconic colors everywhere. They help celebrate Memorial Day, Independence Day, Veterans Day, and most State holidays and birthdays as well. Many also use these colors in their decorating so the USA can be celebrated all year long. Whatever your reason for loving this color combination Apostrophe S has a kit for you, with this All-American Coaster kit. The cost of the kit is $17 plus S&H. Kits are only available while supplies last, so make sure to buy yours before they are out of stock. Most everything you will need is supplied in the kit. The only additional supplies I used is a paper plate, painter’s tape, and some paper to protect my surface from paint splatters. The first thing we are going to do is paint, so make sure to cover your table with paper. Take long strips of the painters tape and fold the end over on itself to create big loops. Adhere these to the table. These strips of tape are going to hold the wood pieces down so you don’t have to hold them and get paint all over your fingers. There are 5 wood laser cut pieces to each coaster. We don’t need to paint the solid base. Separate the pieces out on the strips of tape. You will want one of each shape painted for each color. I painted two coats of each color. When all of the pieces are completely dry it is time to assemble. It is best to start with the outer ring and move inward so you can keep everything centered on the base coaster. Apply a ring around the outer edge of the base. Keeping the edges flush, align the outer ring on the base. Some glue will probably seep out between the two layers, simply wipe it away so the glob doesn’t dry there. Let this piece dry just a bit before moving on to the inside pieces. The pieces are all laser cut and fit perfectly together like a puzzle. Put a good squiggle of glue all over the base and working in, slide the pieces into place. Wipe away any excess glue. Next, paint the outer edge of the coaster the same color as the outer ring. That way if you go up a little on the side, it won’t be noticeable. You’re nearly done! The next step is to seal with the clear coat. Make sure that paint is completely dry before moving onto this step or the clear coat will cause the paint colors to run. Push the sealant into all of the little nooks and crannies to really seal the whole coaster. Don’t forget the sides too! Let dry. Very lightly sand the top and edges of the coaster to remove any bumps caused by the clear coat. If too much pressure is used you will begin sanding the paint giving the coaster more of an antique look. Which is great, if that is what you are going for. Repeat with a second layer of clear coat, followed by light sanding. The very last step is to add the felt circle to the back of the coaster. Use the glue that came in the kit and apply another good squiggly of glue and adhere the circle. That’s all there is to it. The All-American Coasters are finished. Keep them for yourself and celebrate the USA every time they are used. Or, give them away as a handmade gift. What is your favorite patriotic craft you’ve made? Share and leave a comment below. Looking for a fun project where everything you need is included? Check out my Apostrophe S Store and get crafting today! Thank you Cathy, I am so glad that you like them! Thanks for stopping by. Thank you so much for featuring my coasters! This is very nice post. It is the time to show our love to the nation and we can see it everywhere in America, the whole country colored with the match of three color red, white and blue. 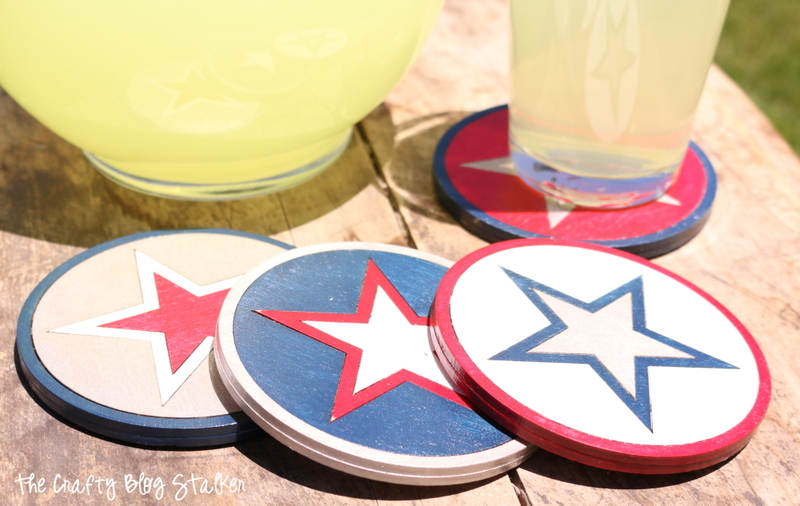 Making American Coasters is a good idea for celebrating the Independence Day. Thank you Dorothy! I am so glad that you like these coasters!